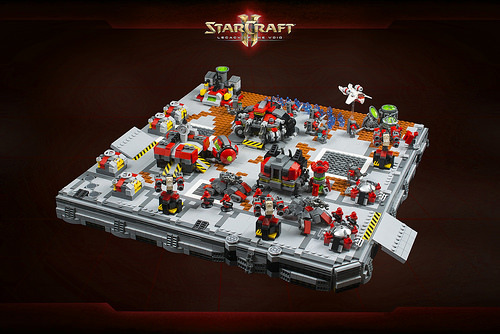 Last year at BrickWorld, a group of builders created a 14-foot-long LEGO StarCraft II display. One of the builders, Cecilie Fritzvold has just now posted detailed photos of her own sections, expanded and updated so she can display them separately at other events — and they’re definitely worth a closer look, especially if you missed the huge display last year. Cecilie’s Terran Dominion base includes everything you need to survive a Zealot rush, from the Command Center to Barracks and a Factory, bunkers for perimeter defense, and plenty of resources. Here’s a great shot of the different Terran structures Cecilie has built. 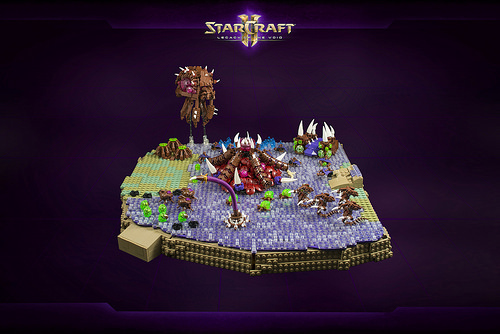 Naturally, the Terrans also need some Zerg to fight off, so Cecilie has built a Zerg Hatchery with an Extractor and even an Overlord hovering above. You can see lots more photos, including her original contributions to previous collaborations, in her album on Flickr.